Private 306762 2nd/7th Bn., Sherwood Foresters (Notts and Derby Regt). Commemorated at: Arras Memorial, Pas de Calais, France. Joseph Barker was born at Selston, Notts in 1896. Son of Thomas Barker, a Bricklayer born in Ironville and his second wife Harriet Barker who, by 1901, were living in Sedgwick Street, Jacksdale. The 1901 Census records that Joseph had younger sisters named Ellen (b. 1897) and Gladys (b. 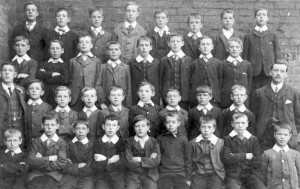 1898) as well as a brother named John (b. 1900). The 1911 Census records Joseph as an apprentice bricklayer, probably to his father. Joseph was recorded as missing in The Red Cross Enquiry Lists on 1st October 1918, but it was obviously determined later that he had actually been killed in action on Thursday 21st March 1918, at Noreuil, France during the German Spring Offensive. Our records indicate that Joseph would have been aged 22 at time of death. He initially served with the 2/8th Bn. The Commonwealth War Graves Commission records that at time of death, he served with 2/7Bn, but by March 1918, the 2/7th’s had been disbanded and posted to the 1/7th Bn and other battalions of the Sherwood Foresters. He was with ‘D’ Company, 14 Platoon, when he died. In 1920 his personal effects amounting to £24 4s were sent to his father Thomas and this included a war gratuity of £12. Joseph is mentioned on his parents’ grave in Ironville Churchyard. His father, Thomas, died in 1942 and his mother, Harriett, died in 1931. Joseph was awarded the British War and Victory Medals. He is commemorated at The Arras Memorial, Pas de Calais, France, one of the 34,768 casualties from the UK, South Africa and New Zealand who died in the Arras sector between the spring of 1916 and 7 August 1918 (the eve of the Advance to Victory) and who have no known grave. John Thomas Stocks 21686 Private 2/7 Bn Sherwood Foresters listed on the Selston, Notts Memorial was killed on the same day, during the same offensive. 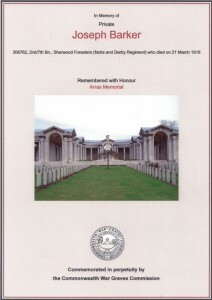 Sherwood Foresters World War One Casualties – 11,409.